Several experts joined hands for the collaborative FLUXCOM initiative. 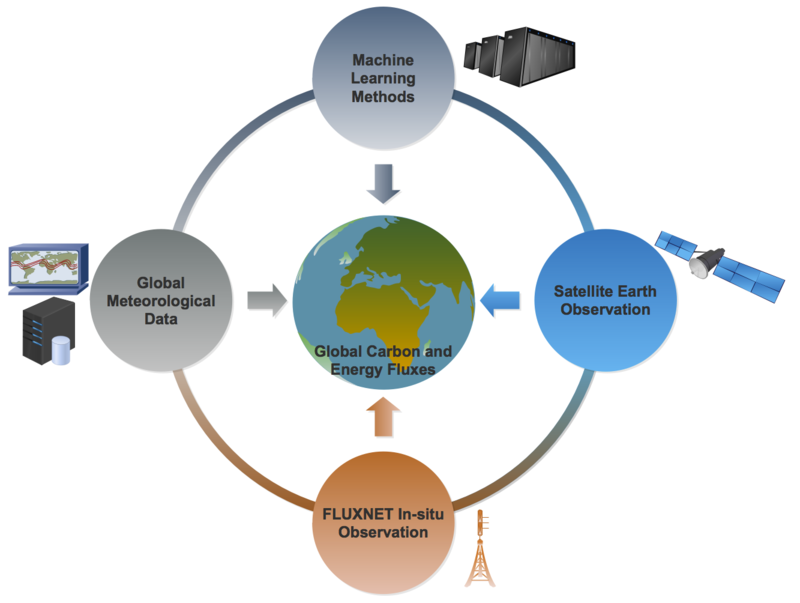 We use upscaling approaches based on machine learning methods that integrate FLUXNET site level observations, satellite remote sensing, and meteorological data. Our data products have promising values for assessing biosphere-atmosphere fluxes over large regions, and for evaluating process-based land models. A general overview of the FLUXCOM initiative. A preprint of the FLUXCOM energy fluxes (paper in review) is now available in arXiv. Based on a recent study, FLUXCOM GPP sees the imprints of relationships between vegetation and groundwater. A study based on FLUXCOM data highlights the compensatory effect of water and temperature on global carbon sink (Jung et al., 2017). The cross-validation paper by Tramontana et al. has been published (2016/07).